Opechancanough, the leader of the Powhatan Confederacy in what is now the U.S. state of Virginia, launches one final attempt to drive out the British colonists who have been continuously seizing native land since 1607. Though Opechancanough is by this point more than 90 years old, he organizes a formidable campaign against the colonists. In the end, however, it fails. Opechancanough is taken prisoner, and then murdered: shot in the back. 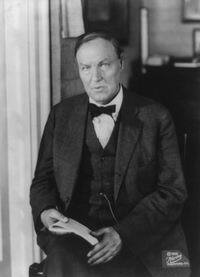 Birth of Clarence Darrow (1857-1938), radical American lawyer and civil libertarian. At first view the title of this work may be found surprising. Reform or Revolution? Can the Social-Democracy be against reforms? 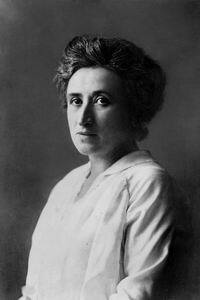 Can we counterpose the social revolution, the transformation of the existing order, our final goal, to social reforms? Certainly not. The daily practical struggle for reforms, for the improvement of the condition of working people within the framework of the existing social order, and for democratic institutions, offers to the Social-Democracy the only means of engaging in the proletarian class struggle, and working towards the final goal – the conquest of political power and the elimination of wage labour. Between social reforms and revolution there exist for the Social Democracy an indissoluble link. The struggle for reforms is its means; the social revolution, its goal. But ... the final goal of socialism constitutes the only decisive factor distinguishing the Social-Democratic movement from bourgeois democracy and from bourgeois radicalism, the only factor transforming the entire labour movement from a vain effort to repair the capitalist order into a class struggle against this order, for the transformation of this order. That the two check-weighmen determine all docking penalties. The coal companies and the state react ferociously. They set out to break the strike at all costs and bring in hired thugs to attack the striking miners. The miners resist, resulting in what is called the West Virginia Mine War of 1912-1913. There are dozens of gun battles in which at least 50 people are killed, martial law is declared, habeas corpus is suspended, and military tribunals are set up to try civilians. In the mining communities themselves, there are many deaths from starvation and malnutrition. The Aldermaston to London “Ban the Bomb” march concludes in London, with 60,000 people gathering in Trafalgar Square to support nuclear disarmament. After a travesty of a trial, Leonard Peltier is convicted of alleged involvement in the killing of two FBI agents. He remains in prison; one of the longest-serving political prisoners in the world. The U.S. follows its normal practice, and ignores international law and the ruling of the court. Israel bombs the United Nations headquarters in Qana, Lebanon, killing more than 100 civilians being sheltered there. A UN investigation determines that the shelling was almost certainly not an accident, as Israel claimed. Amnesty International also investigates, and concludes that Israel intentionally attacked the UN compound. Israel follows its normal practice, and, backed by the U.S., rejects the United Nations and Amnesty reports.